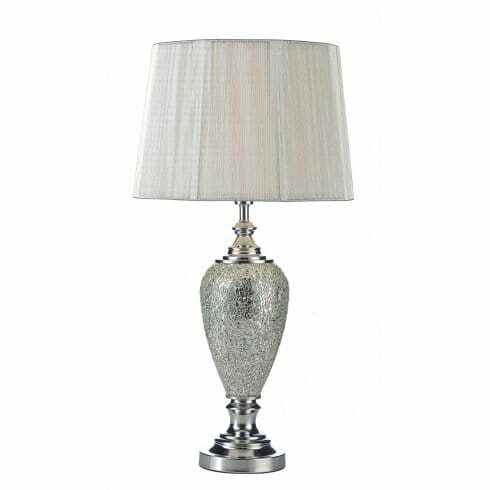 Dar Lighting Arpeggio single light table lamp features a curvaceous vase-shaped stem on a square plinth base and supporting a silver string shade. The product code for this Dar table lamp is ARP4239. The base displays an eye-catching silver mosaic design that compliments the matching shade, while polished chrome metalwork provides shiny highlights and adds a modern edge to the classic design. Beautiful and artistic in design, this bold table lamp will add an elegant touch to both classic and contemporary decors. Alternatively, please see our website for many, many more inspiring table lamp designs in both traditional and modern styles.